This chapter considers the ways in which social and participatory media can be used in education. In particular, it looks at the nature of online interactions and communities. It argues that new forms of more distributed, loose communities are emerging, which require new ways of describing and evaluating them. This chapter describes some of the most common e-learning pedagogies and looks at examples of how technologies can be used to instantiate these. This chapter introduces a community indicator framework (CIF) that we have developed to design and evaluate online spaces and to understand emergent user behaviour in them. This chapter explores the range of user interactions that are now evident in such online spaces, ranging from individual interactions with resources to engagement with distributed networks and online communities. 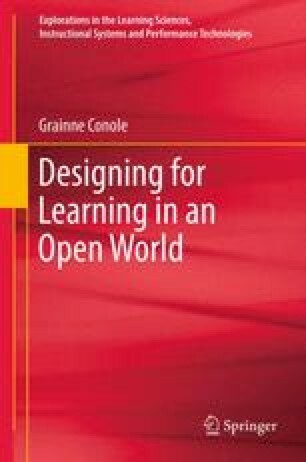 It argues that new approaches, such as the open learning design methodology introduced in this book, are needed if these online environments are going to be effective in supporting more participatory approaches to learning. Anderson, P. (2007, February). What is web2.0? Ideas, technologies and implications for education. Citesser, JISC Technology. Standards watch. Available online at http://www.jisc.ac.uk/media/documents/techwatch/tsw0701b.pdf. Accessed 11 Aug 2011. Conole, G. (2010). Review of pedagogical frameworks and models and their use in e-learning. Retrieved from http://cloudworks.ac.uk/cloud/view/2982. Accessed 11 Aug 2012. Downes, S. (2005). E-learning 2.0. eLearn Magazine, 2005(10). Available online at http://www.elearnmag.org/subpage.cfm?section=articlesandarticle=29-1. Accessed 7 Oct 2011. Godwin-Jones, R. (2003). Blogs and wikis: Environments for online collaboration. Language learning and technology 7(2), 12–16. Available online at http://llt.msu.edu/vol7num2/emerging/default.html. Accessed 7 Oct 2011. Jenkins, H., Clinton, K., Purushotma, R., Robison, A. J., & Weigel, M. (2006). Confronting the challenges of participatory culture: Media education for the 21st Century, MacArthur commissioned report. Available online http://digitallearning.macfound.org/atf/cf/%7B7E45C7E0-A3E0-4B89-AC9C-E807E1B0AE4E%7D/JENKINS_WHITE_PAPER.PDF. Accessed 7 Oct 2011. Jonassen, D. H. (2005). Design of constructivist learning environments. Retrieved from http://www.coe.missouri.edu/%7Ejonassen/courses/CLE/index.html. Accessed 7 Oct 2011. Mayes, T., & De Freitas, S. (2004). Review of e-learning frameworks, models and theories, JISC e-learning models desk study. Available online at http://www.jisc.ac.uk/uploaded_documents/Stage%202%20Learning%20Models%20(Version%201).pdf. Accessed 7 Oct 2011. McLoughlin, C., & Lee, M. (Eds.). (2007). Social software and participatory learning: Pedagogical choices with technology affordances in a Web 2.0 era. Proceedings of the ASCILITE conference, (pp. 664–675). Singapore. Available online at http://www.ascilite.org.au/conferences/singapore07/procs/mcloughlin.pdf. Accessed 7 Oct 2011. Mcylopedia. (n.d.). E-learning and social interaction. From http://wiki.media-culture.org.au/index.php/E-Learning_-_Social_Interaction. Accessed 7 Oct 2011. O’Reilly, T. (2004). The architecture of participation. http://www.oreillynet.com/pub/a/oreilly/tim/articles/architecture_of_participation.html. Accessed 7 Oct 2011. O’Reilly, T. (2005). What is Web 2.0 – Design patterns and business models for the next generation of software. http://oreillynet.com/pub/a/oreilly/tim/news/2005/09/30/what-is-Web-20.html. Accessed 7 Oct 2011. Siemens, G. (2002. October 8). Interaction. http://www.elearnspace.org/Articles/Interaction.htm. Accessed 7 Oct 2011. Sutton, L. (1999). Interaction. Available online at http://seamonkey.ed.asu.edu/∼mcisaac/emc703/leah5.html. Accessed 7 Oct 2011. Wenger, E. (2001). Supporting communities of practice: A survey of community-oriented technologies. Available online at http://www.ewenger.com/tech/. Accessed 7 Sept 2011.